The family is very conservative and the parents are not much educated. Their in laws migrated from the remote place in search of work and settled in Pune. This is the first generation who started for proper education. Now they are aware about the importance of education. Srushti was physically and mentally a healthy child. Now she has started her primary education and if support is given since the beginning then she can develop and take education on the correct path. Srushti's parents are unskilled workers, her mother is a domestic servant for few families and her father is a casual laborer. 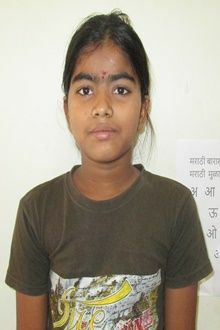 Srushti is having good educational skills and her parents want her to take education and be independent in future. Tell your friends Srushti needs a sponsor!